We use complementary observations from the prototype and expanded Global Muon Detector Network (GMDN) and the Advanced Composition Explorer (ACE) satellite to identify precursors of geomagnetic storm events. The GMDN was completed and started operation in March 2006 with the addition of the Kuwait detector, complementing the detectors at Nagoya, Hobart, and S緌 Martinho da Serra. Analyzed geomagnetic storms sorted by their intensity as measured by the Disturbance storm-time (Dst) index. Between March 2001 and December 2007, 122 Moderate Storms (MS), 51 Intense Storms (IS), and 8 Super Storms (SS) were monitored by the GMDN. 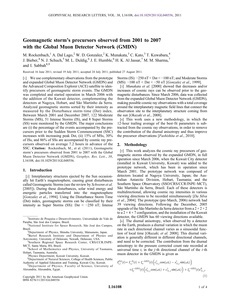 The major conclusions are (i) the percentage of the events accompanied by the precursors prior to the Sudden Storm Commencement (SSC) increases with increasing peak Dst, (ii) 15% of MSs, 30% of ISs, and 86% of SSs are accompanied by cosmic ray precursors observed on average 7.2 hours in advance of the SSC.